We’d love your help. Let us know what’s wrong with this preview of Eternal Frankenstein by Ross E. Lockhart. Two hundred years ago, a young woman staying in a chalet in Switzerland, after an evening of ghost stories shared with friends and lovers, had a frightening dream. That dream became the seed that inspired Mary Shelley to write Frankenstein; or, The Modern Prometheus, a tale of galvanism, philosophy, and the re-animated dead. Today, Frankenstein has become a modern myth wit Two hundred years ago, a young woman staying in a chalet in Switzerland, after an evening of ghost stories shared with friends and lovers, had a frightening dream. That dream became the seed that inspired Mary Shelley to write Frankenstein; or, The Modern Prometheus, a tale of galvanism, philosophy, and the re-animated dead. Today, Frankenstein has become a modern myth without rival, influencing countless works of fiction, music, and film. We all know Frankenstein. But how much do we really know about Frankenstein? To ask other readers questions about Eternal Frankenstein, please sign up. Eternal Frankenstein is a short-story collection consisting of various tales all inspired by Mary Shelley's Frankenstein. I would actually give this a 3.5-star rating (if given the option Goodreads, ahem...). Frankenstein in its original form is one of my favorite books of all time. I think generally people automatically think HORROR when they think of Frankenstein and although it is horrific in many ways, it is also lyrical, thought-provoking and darkly beautiful. This collection I felt paid lo Eternal Frankenstein is a short-story collection consisting of various tales all inspired by Mary Shelley's Frankenstein. I would actually give this a 3.5-star rating (if given the option Goodreads, ahem...). Frankenstein in its original form is one of my favorite books of all time. I think generally people automatically think HORROR when they think of Frankenstein and although it is horrific in many ways, it is also lyrical, thought-provoking and darkly beautiful. This collection I felt paid lovely homage to that original text. This is actually the FIRST short-story collection I have ever read that was not written by Stephen King. So, that's something. I am glad I read it. There were 16 different stories in all written by different authors and all tales were unique and examined the original text in their own ways. Obviously, as I am assuming is the case with all such collections, some of these were much more tailored to my style than others - there were actually a couple that I just did not get at all - but overall I found them enjoyable and grossly entertaining. There is quite a bit of violence and gore in this collection, so true horror fans rejoice! There is no tip-toeing around grotesque and macabre subject matter. In this same line though, I would say trigger warning for self-harm, suicidal ideation, suicide and child abuse/murder. A wonderful and enthralling collection of stories. Word Horde are fast becoming one of my favourite presses. If you are a long time genre reader you know there are hundreds upon hundreds of anthologies that come out every year. Some good, some bad and a few that are just amazing. There are few names that you can see on the edited by line that promise really good work. Some that come to mind for me include Ellen Datlow, Paula Guran, John Skipp and Douglas Winter. In the past names like Martin Greenberg, Charles Grant and Harlan Ellison were the best in the business. I think it is safe to assume we have If you are a long time genre reader you know there are hundreds upon hundreds of anthologies that come out every year. Some good, some bad and a few that are just amazing. There are few names that you can see on the edited by line that promise really good work. Some that come to mind for me include Ellen Datlow, Paula Guran, John Skipp and Douglas Winter. In the past names like Martin Greenberg, Charles Grant and Harlan Ellison were the best in the business. I think it is safe to assume we have a new contender putting his hat in the ring. Ross Lockhart had done enough to garner that consideration with a trilogy of Lovecraftian collections that include Book of Cthulu book one and two. His Tales of Jack the Ripper and Giallo Fantastique are rich examples of his skill. These collections don't just happen for no reason Lockhart released the Ripper anthology on the 125th Quasquicentennial of the murders. So we have this collection in 2016 the 200th anniversary of the year without summer, the year she first conceived of the story which made her famous. Although she didn't write Frankenstein until two years later. Frankenstein's monster and the novel itself has had 200 years to build up a mythology that has expanded beyond just sequels but original films like the Bride or novels like The Brian Aldiss classic Frankenstein Unbound. The idea of a Lockhart edited collection of Frankenstein stories is just almost too good to be true. I know that Lockhart has a keen eye for fresh takes on classic stories. Shelley's Modern Promethus was a story that had many angles and paths the authors could take. There are many authors in the table of contents I am already a fan of such as Edward Morris, Orrin Grey and Tiffany Scandal. There were several I have met but never read like Mike Griffin, Anya Martin and Autumn Christian. Several I had never heard of before. This collection does something I am not sure I have seen before - perfect gender balance. No anthology is going to be perfect, when I read one there will often be stories I don't enjoy as much as others, for me a collection is good when I enjoy more stories than not. 50% is a good average for many but Lockhart anthologies rarely have flat-out stinkers. They are often collected in order to build off each others themes. My two favorite stories include science fiction takes from Autumn Christian's Sewn Into Her Fingers and Edward Morris's Frankenstein Triptych. Two other stand outs were Tiffany Scandal and Damian Angelica Walters tales which explored childhood and the horrors of school. Nathan Carson and Anya Martin explored connections to the Hollywood film. Those six were my favorites of the collection. The only weakness I could find was that the first two stories while setting a traditional gothic tone were the flattest of the book for me. The second part of Frankenstein Triptych by Edward Morris is one of the stronger short pieces he has written in a long career of anthology appearances and as a friend I was really proud of him. Autumn Christian displayed a skill that had me itching to read more. Since those came early found myself thinking they were a better hook for readers. Ross E. Lockhart takes on the role of Victor Frankenstein and in doing so assembles a number of quality contributors to bring forth this anthology of inhuman horror. Lockhart’s press Word Horde is responsible for bringing us a string of consistently quality books over the past few years. Chief editor Ross E. Lockhart certainly has an eye for a great story, and this year I have had the privilege of reading some great Word Horde books from John Langan and Michael Griffin, the latter writer providi Ross E. Lockhart takes on the role of Victor Frankenstein and in doing so assembles a number of quality contributors to bring forth this anthology of inhuman horror. Lockhart’s press Word Horde is responsible for bringing us a string of consistently quality books over the past few years. Chief editor Ross E. Lockhart certainly has an eye for a great story, and this year I have had the privilege of reading some great Word Horde books from John Langan and Michael Griffin, the latter writer providing a great story that is one of the highlights inside this anthology. The first thing that strikes me about this anthology is the wonderful cover art. Created by Matthew Revert, it is another fantastic piece that I can only imagine in hardcover looks even better. Anthologies are sometimes difficult to give a rating too. Often there will be stories that really stick out and some that fall a little flat. Many of the stories feature the familiar theme of reanimation, or regeneration of the flesh and most of the contributors do a stellar job of bringing a fresh take on the subject. There is a bit of a false start with the opening two stories with both leaving me a little underwhelmed. They are not bad stories, they just didn’t blow me away as some others did. However, From here on in the book shows great consistency and imagination whilst exploring the Frankenstein mythos. Mike Griffin’s tale ‘The Human Alchemy’, is one of the earlier pieces that stand-out. It tells the tale of a rich couple of surgeons living in a castle, enticing people to their home and taking parts of their bodies for their own. It is a creepy tale, featuring some suitably atmospheric storytelling and a great twist at the end. It is also one of the longer stories in the book, and I really enjoyed it. I really enjoyed the balance of male and female writers inside of this book, and it is the stories by Betty Rocksteady and Tiffany Scandal that really worked for me. With Betty Rocksteady’s ‘Postpatum’, a single mother tries desperately to come to terms with motherhood. She develops a strange hobby collecting dead animal carcasses in an attempt to create something she can be proud of. There is a certain inevitability about this story, but the inevitability certainly doesn’t dilute the endings impact, leaving this reader a little teary eyed. Tiffany Scandal also takes an unusual approach with her story…it looks at a girl called Imelda, who is constantly bullied at school because of the way she looks. It is only a short story but certainly left me feeling emotionally drained and wanting to read more from this talented writer. It isn’t all about girl power though, Orin Grey came up with a ripper about a TV host called Barron Von Werewolf who plays an old Frankenstein movie…No big drama, only there lies a problem in that past players of this video have all suffered dire consequences. This story kind of read like an old Tales from the Crypt episode. It’s quite campy, but really well-done. The ending turns suddenly quite sinister and dark, leaving a lasting impression. Getting deeper into the collection and another gem came through ‘Wither on the Vine’ by Nathan Carson, This story features Nicola Tesla and a strange experiment that goes horribly wrong! This is an intriguing tale that builds and builds until an ending featuring some wonderfully dark images as the experiment takes an unexpected turn for the worst. The final tale is by David Templeton. He finishes things off with a tale about Mary Shelly that talks about her life and her work. Whilst it is well done it did feel a little too long to me and my I found my attention wavered a little. This is a perfectly balanced anthology. There is no filler. All of the stories are award worthy. Looking forward to Word Horde's next effort! Eternal Frankenstein is an anthology of sixteen stories, some long, some short, each with its own unique take on Mary Shelley's novel Frankenstein; or, The Modern Prometheus. 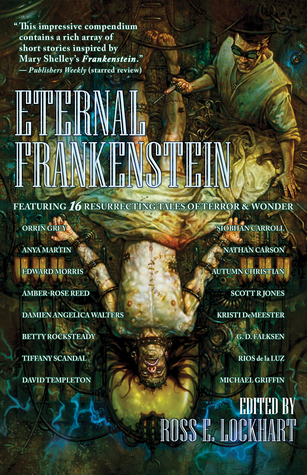 While all the stories found within are creative, with each author's take of revival through the horrifying means Victor Frankenstein took to to bring life to his Creature, there are some that I consider my favorite: Amber-Rose Reed's "Torso, Heart, Head," Autumn Christian's "Sewn into Her Fingers," Michael Griffin's "The Hu Eternal Frankenstein is an anthology of sixteen stories, some long, some short, each with its own unique take on Mary Shelley's novel Frankenstein; or, The Modern Prometheus. While all the stories found within are creative, with each author's take of revival through the horrifying means Victor Frankenstein took to to bring life to his Creature, there are some that I consider my favorite: Amber-Rose Reed's "Torso, Heart, Head," Autumn Christian's "Sewn into Her Fingers," Michael Griffin's "The Human Alchemy," Betty Rocksteady's "Postpartum," Tiffany Scandal's "They Call Me Monster," Nathan Carson's "Wither on the Vine; or, Strickfaden's Monster," and G.D. Falksen's "The New Soviet Man." These four were well written, and made me think about existence and our sense of self. My least favorite was "Mary Shelley’s Body" by David Templeton. I ended up only reading half the story because I was so bored and just wanted it to be over. The Eternal Frankenstein anthology was, as a whole, quite well written, however some of the stories really weren't that great, instead closer to the lines of predictable and boring. I rate this book four stars despite my boredom or distaste to a couple of the stories since the ones I liked, were really, really interesting a few even with twists that made me gasp or laugh, and the concluding story of Mary Shelley's Body tied everything together so nicely. Interesting is a good word to describe thi The Eternal Frankenstein anthology was, as a whole, quite well written, however some of the stories really weren't that great, instead closer to the lines of predictable and boring. Interesting is a good word to describe this collection of short stories, as they, as a collection address the morality behind resurrection and the creation of new life, rather than being overly gruesome, gory or horrific it was thought-provoking. Eternal Frankenstein was another book I've had on my TBR for way too long. This is an anthology of 16 short stories, all based of the concept of reanimation, first introduced to the world by Mary Shelley 200 years. While the premise was interesting, none of these short tales really grabbed me by the throat and made me stay riveted. A few of these stories were decent, with some fairly interesting characters, but overall I don't foresee myself grabbing this book of the bookshelf for a reread any t Eternal Frankenstein was another book I've had on my TBR for way too long. This is an anthology of 16 short stories, all based of the concept of reanimation, first introduced to the world by Mary Shelley 200 years. While the premise was interesting, none of these short tales really grabbed me by the throat and made me stay riveted. A few of these stories were decent, with some fairly interesting characters, but overall I don't foresee myself grabbing this book of the bookshelf for a reread any time soon. A fairly solid collection of short stories. Naturally, there's some variation in quality, though I'm sure if you had five people rank the stories, you'd end up with five completely different lists. Some stories are genuinely unnerving, and other have some absolutely beautiful passages. The stories stay consistent to the theme of the collection, so how much of this you want to read in one sitting will certainly depend on how enamored you are of Frankenstein's literary and pop cultural legacy. Eternal Frankenstein (2016) asks horror writers to imagine, or reimagine, the life of Mary Shelley’s infamous doctor and his “creature.” The book includes 16 stories, all of them original to this anthology, with one that appeared in a different form in the publication Perihelion. Make no mistake, these are horror stories. Some may glance at science fiction, and some flirt with fantasy, but their primary purpose is to scare us, or make us uncomfortable as we read, and this collection succeeds at that. I had previously reviewed this book but I'm not sure what happened to it. Some of the stories in this book were great, some were hard to get through. Another issues I cam across was editing errors. There weren't as many as some of the other books I've read from Ross E. Lockhart/ Word Horde. I wanted to love this book, but, the errors can be distracting and take away from the stories. Sixteen short stories can't be saved by one good one at the end and maybe one or two middling ones throughout. I can honestly only give 3 out of 16 of these short stories 4 stars. Two others received 3.5 and one a 3, three earned 2, four a 1 and two (I’ve never, ever done this before) got a big fat zero. Indeed! Shelley’s Monster needs no introduction, although its many reinterpretations and reincarnations over the past (almost!) 200 years might leave people with competing ideas over who and what it is and represents. But anyone with a passing familiarity to film and horror knows the basic premise of man-creates-monster, and surely would recognize some form the Monster has taken over the years, whether in the iconic and stoic visage of Karloff, the misshapen face of Lee, the re-animated ghouls of a certain Stuart Gordon film, or even a seasonal breakfast cereal. My first encounter with the Monster was probably Mel Brooks’ interpretation in Young Frankenstein, which is arguably the greatest film inspired by Shelley’s work. Or perhaps it was in the shadowed halls of Castlevania, low on health and hoping I had the right subweapon to finish off the pixelized terror. We all have a connection to Shelley’s creature, and our own ideas about what it is and what it should mean. The assembled authors in Eternal Frankenstein share with us their own visions of the Monster’s horror, through tribute to Saturday morning movies, through science fiction settings and motifs, through stories focused on emotion and personal trauma. Amber-Rose Reed’s “Torso, Heart, Head” starts the anthology off strong, with a backstory for the different parts of what might become a monster. Her story proves that callback with a touch of pastiche can still pack an emotional punch while remaining a bloody good time. Autumn Christian’s “Sewn Into Her Fingers” jumps right into SF territory with a narrative that is both disturbing, hopeful, and frighteningly plausible. “Baron von Werewolf Presents: Frankenstein Against the Phantom Planet” by Orrin Grey represents so much of what makes his Technicolor-tinted style of horror writing so fun and wonderful, as it follows a “lost” foreign Frankenstein/science fiction movie presented by a goofy and doomed TV horror host. “The New Soviet Man” by G.D. Falksen is tied for my favorite story of the anthology. A Soviet officer and his attache head to a remote research facility to root out disloyalty but instead find the future of worldwide socialism writ in flesh and brain tissue. David Templeton’s novella “Mary Shelley’s Body” caps off the anthology with a re-examination of Shelley’s life by her ghost, a post-death autobiography about her victories and defeats, her love, her Monster, and her monstrous love. Along with Falksen’s story, Templeton’s tale told through Shelley’s own voice is a high point of the book, and is a must-read for any fan of the famous author and the Monster. Firstly, the case biding or hard back cover is absolutely beautiful, very old time and Gothic-style.